Ontario Transportation Minister Bob Chiarelli says he won't speculate on the cause of a crash that killed 11 people near Waterloo, saying he wants to hear the results of a police investigation before taking any steps to prevent similar collisions. Ontario's transportation minister won't speculate on the cause of a crash that left 11 people dead west of Waterloo, Ont., saying that he wants to hear the results of a police investigation before taking any steps to prevent similar collisions. "I think it's really important that we rely on the investigative professional services of the OPP," Bob Chiarelli told reporters Tuesday. "This accident is less than 24 hours old, and we're not going to provide solutions until we know the facts." Investigators in southwestern Ontario are trying to determine the cause of the deadly crash, which killed 10 Peruvian nationals in a van and a Canadian citizen in a truck. Collision reconstruction experts worked late into the night near Perth County Road 107 and Line 47, the intersection where the crash occurred at 4:50 p.m. ET Monday in the hamlet of Hampstead, 23 kilometres northeast of Stratford. Chiarelli said he believes it is "highly likely" that the coroner's office will also investigate Monday's crash. Ontario government officials are looking into various aspects of a crash that killed 11 people near Stratford. Health Minister Deb Matthews is checking whether the three survivors are covered under the provincial health plan. Matthews says seasonal migrant workers in Ontario are covered from the time they arrive in the province, assuming all the proper procedures have been followed. As well, Labour Ministry investigators are looking into who was in the van, who they worked for and who was transporting them. "This is not a regular accident. We're talking about foreign workers, we're talking about 15-seat vans, we're talking a municipal road — this is not a provincial highway," he said. Ten of those killed were migrant workers in the van, while the truck's driver also died. He has been identified as Christopher Fulton, a 38-year-old driver from London, Ont., with Speedy Transport Group, Inc. The coroner's office in Toronto is working to help identify the van occupants. Ontario Labour Minister Linda Jeffrey had said some of the workers were from Peru and some from Jamaica. But officials at the Peruvian consulate confirmed later Tuesday that 10 nationals from that country had died in the collision. Friends of the victims gathered to mourn at the site of the crash Tuesday, creating a memorial of candles, flowers and streamers of red and white — the colours of the Peruvian flag. Three people from the van survived the crash with serious to life-threatening injuries. One was airlifted to a hospital in Hamilton. The other two were taken to hospital in Stratford, though one was later transferred to London Health Sciences hospital. Perth County Ontario Provincial Police Const. Kees Wijnands, a police officer for 25 years, said Tuesday it's a "great thing" the survivors are still alive. "That's really very amazing considering the crash that we saw there, the impact and the carnage that was out there. It's a miracle that these people are still living," he said at a news conference in Milverton, Ont. Insp. Steve Porter, detachment commander for the Perth County OPP, described the crash as the worst he has seen in 28 years on the job. The collision propelled the van between 20 and 30 metres from the intersection, and it came to rest next to a house. The truck was flipped onto its roof. Perth County Emergency Management Services said five of the victims were dead when fire officials arrived, and the others died as paramedics tried to help them. The workers in the van had just finished a day of work vaccinating chickens at Hampstead Poultry, the farm's co-owner Albert Burgers said Tuesday morning. 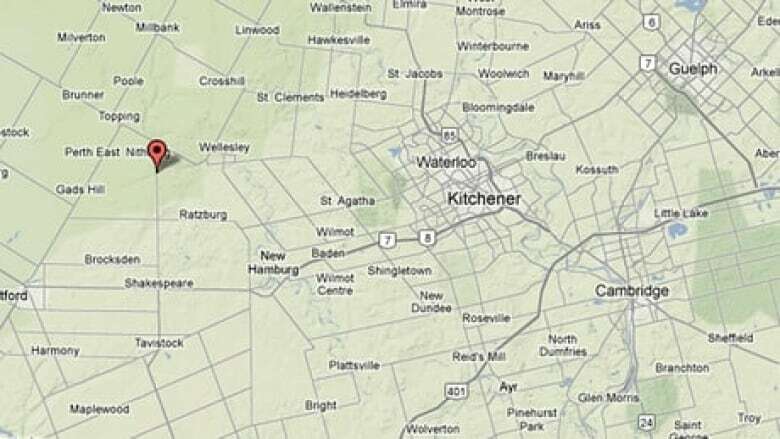 Burgers said he wasn't sure who the victims were because two vans had left the farm carrying migrant workers, but he thought the workers were living in Kitchener and their ages ranged from 19 to 55. "I really feel sorry for the people back home, because you know, you don't want to get a phone call like that," Burgers said. "I really feel sorry for these people. Nobody wants to get that call." Jaime Sparks, deputy consul general at Peru's consulate in Toronto, said officials there will notify families of the victims once all of the migrant workers involved are identified. A number of the victims spoke Spanish, CBC's Steven D'Souza said, which made it difficult for emergency workers to communicate with them. 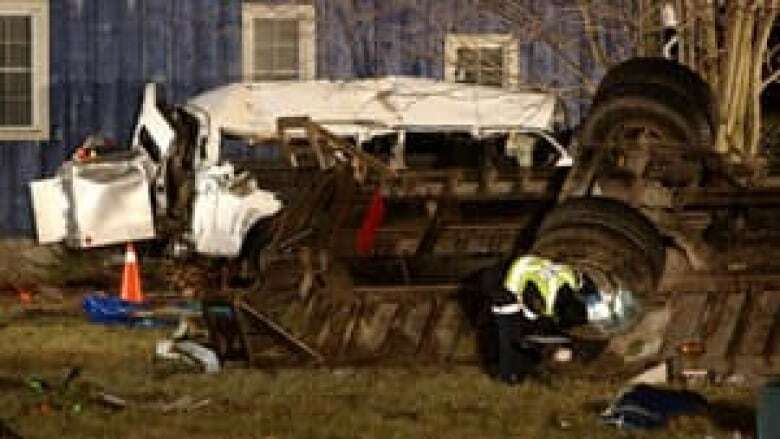 Jared Martin, chief executive of Speedy Transport, said he was told by provincial police that the van ran a stop sign and was struck broadside by his company's flat-bed truck. The crash left deep tire tracks in the mud just off County Road 107. The nearby intersection was left with scraped asphalt and skid marks. Martin said this was the company's first fatal collision. The truck was travelling south on County Road 107 and the van was heading west along Line 47 when the vehicles collided. Monday's crash is not the first time that farm or migrant workers have been hurt or killed while travelling together on Canadian roads. In March 2007, a van carrying farm workers overturned on a stretch of highway in Abbotsford, B.C. Of the 17 people on board, three died, and the others suffered injuries. In September 2005, the Guelph Mercury reported a crash near Delhi, Ont., that left two Jamaican migrant workers dead. The Justicia For Migrant Workers organization would later report that they were among five migrant workers who were seriously hurt or killed while cycling on Ontario roads that season. Const. Wijnands said east-west traffic on Line 47 was controlled by a stop sign at the intersection, but he wouldn't say whether police believe the van failed to stop. "All we have is that the van was in the intersection, where I guess it shouldn't have been," he said. Investigators and residents living in the area expressed more shock Tuesday morning. "It was a horrific crash," London OPP Sgt. David Rektor told CBC's Metro Morning. "Both vehicles had been pushed off the roadway into the southwest ditch," said Rektor, adding it looked as if the van had been "squeezed in half and pushed up against a home. The debris field was immense and it's a horrific scene." Area resident Linda Koehler described the scene as "unbelievable." "It's a bad road, a hilly road, and I travel it every night. I was supposed to go into work last night, but I decided not to, and thank God I didn't, because I would have been heading down that road at the time when it happened," she told CBC News. Another woman who lives at a home diagonally from where the vehicles ended up said she had not heard of any other accidents happening at that intersection. The woman, who did not want to be identified, told CBC's Mark Gollom she was in the kitchen when she heard a loud bang and thought it was her husband slamming a door, "but he didn't come up the steps, and I looked out the window and saw it right away." Her husband went to help, but "there was nothing to do, nothing you could do, other than talk to the one that was conscious and he didn't speak English," she said. Most of the wreckage had been cleared from the crash site by 8 a.m. ET Tuesday. Only the front grille from the van still lay on the grass near the road. Operators of the Hampstead poultry farm say they received an email from Brian's Poultry on Tuesday saying all work has been cancelled for the next two weeks because of the accident. CBC News brings you the latest on the deadly crash near Waterloo, Ont. Deadly collision in Hampstead, Ont.